VDSL Slowdown - Spark unhelpful! Forums › Spark New Zealand › VDSL Slowdown - Spark unhelpful! I've only posted a couple of times on here but always been overwhelmed by how helpful people are! I'm having an issue but not getting much joy dealing with Spark so hoping someone here will be able to give some advice. We have a VDSL connection. We are at the distance limit from the exchange but have a very stable connection. Latency (using the spark speedtest) is usually around 23ms, Download 13, upload 0.9. Not perfect but works well for us. We only watch streaming TV, and usually have no issues, even when the kids are using computers elsewhere for game playing etc. On friday all of our streaming services stopped working (Apple TV, Roku 3 and Roku stick). A speediest (when it eventually loaded) had a latency of 1468 and the download speed was 1. I have a TG589vn v2 bridged to a Linksys WRT1900ac. I reset both of these (soft reset first, and then hard reset and re-input the settings) and no improvement. All wiring is intact and no evidence of damage. When Chorus installed the VDSL we were unable to find the point where the cable entered the (old) house, and so we dug up the garden and the engineer installed a new termination point on the outside wall, and ran a new cable to a dedicated point inside. So I'm guessing the internal wiring is fine. So I decided it must be a Spark issue and would see if it resolved itself. The following day there was no change - speed tests vary enormously . Latency is always higher than normal - the best I've seen is about 98 and the worst 1500. Download speeds are varying from nothing (the page won't even load) to 10. I reset the TG589vn to act as modem and router (to remove the Linksys router from the chain) and no improvement. I logged a call with Spark who did a line test, advised there were issues, and that they would get an engineer to check the line. they advised that he would contact me if he needed access to the house. I called again yesterday to report no improvement and check on progress. This time language was something of a barrier, but the lady said she would put in a request for information and call me back in an hour. When she called back she said there was no problem with the line and the speeds I getting are the best possible for the line. I disagreed, seeing we have had a stable 13 download speed for twelve months or so, and now the speed is all over the place. She said they would keep an eye on the line but there's nothing further they could do. This morning I swapped the modem out for a HG659b I use at work. No change - five speed tests in a row will produce five different results, lowest being a fail to initialise and the fastest today being 6 download. The graph which appears is usually fairly solid but since I've being having this issue it looks like the southern alps...all peaks and troughs. I felt from the conversation with Spark last night that they have done what they are going to do. But having tried a different modem (and being confident the internal wiring is good) I'm at a loss. Sorry it's a wordy post but wanted to give as much information as I could! Hoping someone can advise if there's anything else I should be doing, or if I've missed something obvious! EDIT with info as requested by the robot! - If you know your connection is to an exchange, cabinet or conklin No idea. - If your connection is to a ULL or wholesale service No idea. - If you have done an isolation test as per the link above All testing done on an iMac connected via ethernet. Wifi on the modem is off. Be glad you didn't get charged $150 by them for no fault found like they have done to my flatmate for logging a fault for his vdsl becoming crap. Basically they don't care about the copper anymore. It's old and why fix what will they will be paid to replace with fiber sometime soon. You may be better off moving back to adsl since your upload speed was always bad it means your like was probably borderline for vdsl even working and has now become worse. Could the cross talk make this worse? Maybe revert back to ADSL2? please follow peter readers advice and answer his questions the best you can. Speedtests can be unreliable so we need more info on your connection. you'll probably be better off just moving back to ADSL. Minimum acceptable speeds for a VDSL connection are generally agreed to be 15Mbps down, 5Mbps up. I don't understand why you paid for VDSL when you were only getting ADSL speeds. As others have said, go back to ADSL - your connection may improve. You did not mention having a VDSL master filter - on a line like yours this is mandatory. Hi, thank you for all your replies. I've posted the info gleaned by telnet above. There is a splitter - installed outside in the junction box when the engineer ran the new line into the house. I understand all the comments about being on ADSL - we were only getting download speeds of 6 or so on ADSL and so 13 was a significant improvement. I appreciate that with the VDSL install came new internal wiring and so the ADSL speeds could have course have improved as a result of that. What I really don't understand, though, is how I could have a totally stable connection for twelve months or more, and suddenly on Friday a severe deterioration in speed. I suppose that's what I'm trying to understand. I don't really want to move off the VDSL plan because we are moving house in a month and will be much closer to the exchange. However that's a month away and in the meantime I have Spark saying nothing's wrong, my speed is as good as the line will support. Yet last week we could stream HDTV and this week I can barely load a webpage. At best I'm getting download speeds of 6, and often the page won't load at all. So clearly something has changed somewhere! Probably water in the line somewhere. They will not investigate it based on a couple of friends experiences and will just have you doing the runaround dance with isolation tests and port resets and wait 24 hours for that to happen etc till it drys out and starts working again. richms: Probably water in the line somewhere. They will not investigate it based on a couple of friends experiences and will just have you doing the runaround dance with isolation tests and port resets and wait 24 hours for that to happen etc till it drys out and starts working again. Chrisclarke: Hi, thank you for all your replies. I've posted the info gleaned by telnet above. First off your speed was NOT satisfactory. It was below VDSL2 spec and I'm really, really, really surprised you even had working VDSL2. That is the worst VDSL2 sync speed I've ever seen. If you only had 6Mbps on ADSL2+ it was because of poor internal wiring. There is no way somebody getting that speed on ADSL2+ would ever get VDSL2 normally. 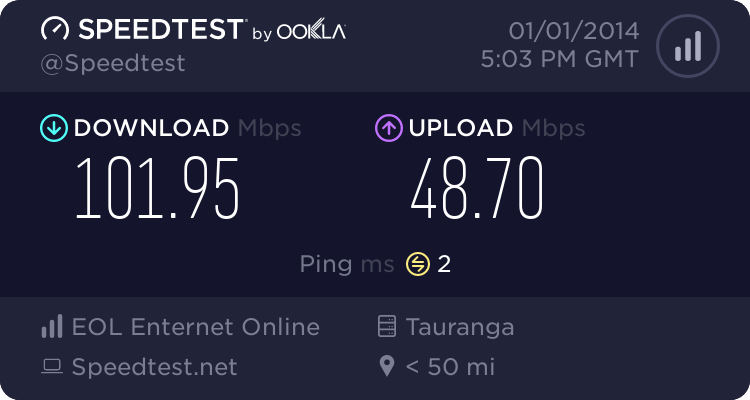 With those stats after an install your connection should have immediately been moved back to ADSL2+ because it was unsuitable to stay on VDSL2. With such an incredibly poor connection it would take very little to make it totally unusable - whether this be something as simply as moisture in a connection, or more likely far end crosstalk from other VDSL2 connection. Thanks for that. I should have said that the download speed was satisfactory for me! The first Chorus guy that came installed the splitter inside the house. He left with the connection not working well, which I understand shouldn't have happened. I had a battle getting Telecom to send them back to do the job properly. The second guy was excellent and was patient while I dug the garden up to find the incoming line. He fixed a box to the wall outside, with the splitter in it, and crawled around under the house to run a line to a new socket in the living room. All that took two weeks and I was so glad to have a working connection I just accepted the 13 download speed. - wait for 24 hours and see if it continues to improve. If it does, it could be moisture somewhere drying out? - if there's no improvement call 123 again and ask them to revert the connection back to ADSL. Does that sound like a sensible approach? I'm aware of a Chorus fault that has begun affecting a number of our customers (not anywhere near all!) in East Auckland last Friday in terms of their speeds at peak times. If you PM me your details I should be able to tell you if this is affecting you or not. We do not have an expected time of resolution from Chorus on this issue. sbiddle: ... First off your speed was NOT satisfactory. It was below VDSL2 spec and I'm really, really, really surprised you even had working VDSL2. That is the worst VDSL2 sync speed I've ever seen.